Latrobe Uni 3s jumped out to an early lead on Research and captured a 13-4 victory on Saturday at Westgarth. The game was decided quickly as Latrobe Uni exerted its will early with 10 runs in the first three innings. Two wild pitches, an RBI single by Chuck Ratnayake, a two-run error, and a wild pitch during the first inning and a groundout by Eamon Clancy and a passed ball in the second inning helped Latrobe Uni put some runs on the board early. Latrobe Uni got its bats going early, scoring seven runs in the first inning to pull ahead of Research. Tony Bullen recorded the win for Latrobe Uni. He allowed four runs over four innings. He struck out four, walked none and surrendered nine hits. Latrobe Uni 3s and Watsonia lit up the scoreboard on Saturday as they combined for 26 runs. In the end, Latrobe Uni 3s won the offensive battle 14-12 in four innings. The teams combined for 19 hits, including three extra base hits. The teams traded runs for most of the contest, leading to seven lead changes in the game. Latrobe Uni 3s took the lead in the fourth inning and held on for the victory. Latrobe Uni 3s scored on a two-run double by Lou Scolia, scoring Brett Bennell and Chuck Ratnayake. Lou got on base four times in the game. He scored two runs and had two RBIs. Chuck got the win in relief. Chuck pitched 2 1/3 innings and allowed two runs. In the top of the first, Latrobe Uni 3s grabbed the early lead, 1-0. Brett started the rally with a single. A stolen base then moved Brett from first to second. Eamon Clancy singled, scoring Brett. After a quick strike from Latrobe Uni 3s, Watsonia responded with four runs in the first. The lead was Latrobe Uni 3s to lose after fourth inning. More runs came home on a fielder's choice and three singles. Report by Sally Heppleston - originally posted on the MWBL website. 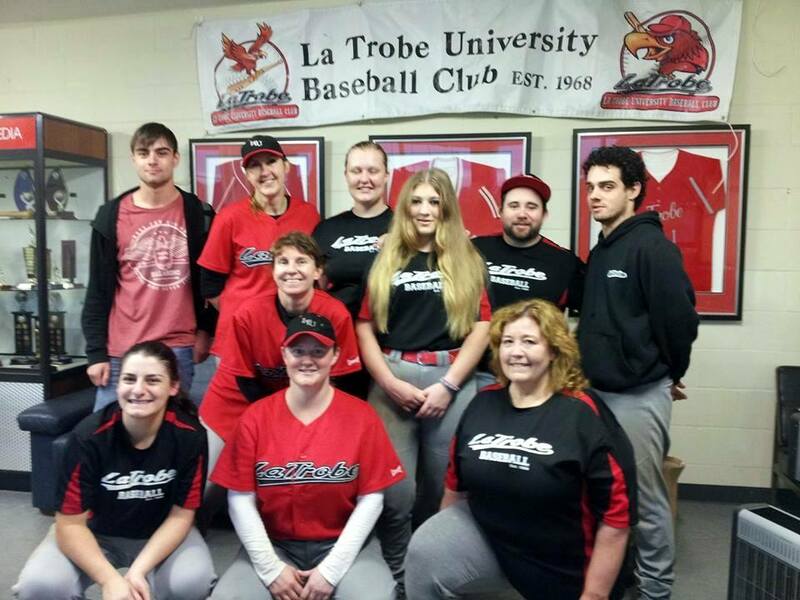 LA TROBE University Baseball Club won in a walk-off nail biter against university rivals Monash in round 15 of the Melbourne Winter Baseball League B Grade competition at La Trobe’s home diamond on Saturday. The 4-3 win now puts La Trobe one game clear in the top four. La Trobe coach Alex Turlea said Jimmy Furhmann had two hits and while Tom Wilson didn’t have any hits, he still scored for his club three times. Thom Irwin also hit a double. He said D’Arcy Mills also pitched well, and that only two of the runs hit off him were earned. Turlea also praised Monash pitcher Kiyotaka Ondera, who threw the ball well all day. Monash coach Michael Hunt said Ondera, who is a teacher at Monash, threw the complete match and had been impressive for the club for the past few weeks. Hunt said while it was disappointing to go down in such a close game, it was the fielding that ultimately cost his team the win. “We just can’t seem to win the close games, but thems the breaks,” he said. La Trobe face top side Forest Hill next week, who have only lost one match for the season, which was against La Trobe when they played them earlier in the season. LA TROBE University has escaped with a narrow 5-4 win against relegated side Croydon, in round nine of the Melbourne Winter Baseball League B Grade division. La Trobe coach Alex Turlea said it was a tight match with some strong hitting from his team. He said Tristan Pinkster, Dean Sharples and himself all hit the ball very well at their home ground win. “Tristan hit a home run, a triple and a single and was the stand out,” he said. He said while Croydon had struggled through the early part of the season, they had improved in past weeks and provided tough competition. “They had pitchers who mixed speeds and really kept us off balance,” he said. Croydon coach Daryn Cassidy said it was a game his team could have won, but that some close calls on the plates put the game just out of reach. He said some excellent hitting and a home run put La Trobe in front, but that his team didn’t stop fighting. Cassidy said his club was improving with each week. “These are players that have played together for a long time, but haven’t really played together as a team. But we’ve got some confidence in our ability now and we’re improving more each week,” he said. He said while finals were out of the question, he was confident his players could knock off a few of the top teams before the end of the season. La Trobe now sit comfortably with six wins and three losses and Turlea said he was very happy with how the season was going so far. La Trobe take on bottom side Bundoora at Bundoora’s home ground next week. Croydon are away to Doncaster. In other B Grade results, North Coburg Rebels got the better of Bundoora 12-2 and Forest Hill kept Diamond Creek scoreless, 3-0. Fans were treated to a high-scoring affair Sunday as the Women's Team outscored Essendon 12-10 in four innings. The two teams combined for 22 hits in the game. The Women's Team pulled out the win thanks to a strong fourth inning. In the top of the first, Essendon grabbed the early lead, 6-0. After posting two runs in the second, Essendon again scored two in the third. It didn't take long the Women's Team to answer as it scored three runs of its own in the second. LTU Women's scored on a two-run hit by Michelle Graham and an RBI single by Lesley Hutchison. LTU Women's answered Essendon's top inning with seven runs of its own in the third. LTU Women's scored on an RBI single by Christina Brasacchio, a bases loaded walk by Michelle Graham, a walk by Michelle Love, a walk by Alyssa Stewart, an RBI single by Sue Papas, and a two-run single by Christina. UNIVERSITY rivals Monash and La Trobe clashed on Saturday with La Trobe coming out on top 10-5 in round six of the Melbourne Winter Baseball League B grade competition. La Trobe University coach Alex Turlea said everyone in the team hit the ball well and that pitcher Tristan Pinkster performed strongly on the mound all day. La Trobe have now had three wins in a row after beating North Coburg comfortably last week and Melbourne University the week before that. “Everyone is starting to play really well together and we’ve had a full squad, which had made a difference,” Turlea said. La Trobe, now placed with 4 wins and two losses, come up against Forest Hill at Forest Hill next week, which Turlea said would be a big test. Monash coach Michael Hunt said his team left their run too late to get the points. “They played well and we just didn’t show up for the first three innings,” he said. Hunt praised the efforts of La Trobe pitcher Pinkster and also their own closing pitcher Langston Lightcap, a US recruit who will play with Monash until he returns in July. “He really shut them down,” Hunt said. Monash sit at 1-5 but Hunt said he his team had come up against some tough competition and had been competitive in each match. Latrobe Uni 3s refused to relinquish the lead after grabbing it early against Knox, recording a 12-5 victory on Saturday at home. With 12 runs in the first three innings, Latrobe Uni left no doubt about the eventual outcome. An RBI single by Joe Filardo, an RBI double by Lou Scolia, an RBI single by Todd Robinson, an RBI double by Paul Albano, and a two-run single by Brett Bennell in the first inning and an RBI single by Tony Bullen, an RBI single by Colin Richardson, a wild pitch, an RBI single by Caleb Stott, and an RBI single by Henry Formosa-Doyle during the second inning helped Latrobe Uni put some runs on the board early. Joe was hot from the plate for Latrobe Uni. Joe went 3-4, drove in one and scored two runs. Tony got it done on the bump on the way to a win. He allowed four runs over four innings. Tony struck out four, walked three and gave up four hits. Alyssa Stewart went 1-1, but LTU Women's still fell to Footscray 9-6 in four innings on Sunday at Melbourne Uni. Alyssa reached base three times in the game. She singled in the first inning. The top of the first saw Footscray take an early lead, 1-0. After a quick strike from Footscray, LTU Women's responded with two runs in the first. LTU Women's scored on a wild pitch and an RBI single by Lesley Hutchison. Footscray went up for good in the second, scoring seven runs on an RBI double, a two-run error, two singles, and an RBI triple. LTU Women's scored four runs in the bottom of the fourth to cut its deficit to three. A fielder's choice, an RBI single by Michelle Graham, an RBI single by Sue Papas, and a passed ball sparked LTU Women's' rally. Pitchers had a tough day during the game between Latrobe Uni 3s and Croydon, as the two teams put up 27 runs combined in a 19-8 Latrobe Uni win. The teams combined for 20 hits, including seven extra base hits. Thirteen runs in the opening three innings allowed Latrobe Uni to easily put away Croydon. A wild pitch, an RBI single by Tony Bullen, a two-run triple by Henry Formosa-Doyle, and an error during the first inning and a two-run double by Lou Scolia and an RBI single by Tony in the second inning supplied the early offense for Latrobe Uni. Lou racked up three RBIs on three hits for Latrobe Uni. Tony got the win for Latrobe Uni. He allowed three runs over four innings. He struck out three, walked three and surrendered four hits. LTU Women's fell 9-0 to Monash Uni at Monash Uni on Sunday. Allison Steane handled Monash Uni's lineup with ease, racking up eight strikeouts. Allison allowed two earned runs, five hits and four walks over 3 2/3 innings. The game was never in doubt after the first, as Monash Uni scored five runs. Pitchers had a tough day during the game between Latrobe Uni 3s and Knox, as the two teams put up 25 runs combined in a 16-9 win to the 3s. Hitters on both sides were strong at the plate as the teams combined for 23 hits, including four extra base hits. The 3s had 14 hits, including four extra base hits, including seven runs in the fourth on a two-run double by Joe Filardo, a walk by Aaron Gallagher, a passed ball, an RBI single by Todd Robinson, and a two-run single by Henry Formosa-Doyle. Joe racked up five RBIs on two hits for Latrobe Uni. The 3s hammered Knox pitching as six hitters had a field day, combining for 11 hits, 11 RBIs and 14 runs scored. The 3s never surrendered the lead after the first inning, scoring five runs on a two-run double by Tony Bullen, a fielder's choice, and two singles. After pushing across two runs in the bottom of the third, Knox faced just a 9-7 deficit. An RBI single and a fielder's choice fueled Knox's comeback. Finally, Colin Richardson got the last Knox to ground out to end the threat. LTU Women's lost 16-3 to Berwick on Sunday at Berwick, despite a total of six hits. Christina Brasacchio reached base two times in the game for LTU Women's. She scored two runs and had one RBI. She singled in the second inning. The game's lead went to Berwick thanks to a first inning rally that saw seven runs cross the plate. Two runs in the top of the second helped LTU Women's close its deficit to 7-2. An RBI single by Christina and an RBI single by Shelly Love triggered LTU Women's' comeback. Berwick survived LTU Women's' surge and put up seven runs of its own in the second. After pushing across one run in the top of the fourth, LTU Women's faced a 16-3 deficit. An RBI single by Allison set off LTU Women's rally. But it was not enough to get LTU Women’s team into a winning position. Latrobe Uni 3s shut the door early on Croydon, capturing a 17-0 victory on Saturday 30th of April at Latrobe Uni. Fourteen runs in the first three innings allowed the 3s to put the game away early. A two-run single by Lou Scolia, an RBI single by Joe Filardo, a wild pitch, a two-run single by Colin Richardson, and an RBI single by Jeff Bartels during the first inning and an error, a wild pitch, a bases loaded walk by Jonah Shields, a wild pitch, and another wild pitch in the second inning supplied the early offense the 3s. Joe racked up two RBIs on three hits for Latrobe Uni. Tony Bullen looked sharp on the rubber. Croydon managed just one hit off of the Latrobe Uni 3s pitcher, who allowed no earned runs, walked none and struck out four during his two innings of work. Colin got the win for Latrobe Uni. He pitched two shutout innings.